To Cite: Taban E, Yazdani Aval M, Ahmadi O, Miri M, Fereidan M, et al. Study of Personal Hearing Protection Devices Usage in Kashan Carpet Industry Workers, Health Scope. 2016 ; 5(4):e35250. doi: 10.17795/jhealthscope-35250. Background: Exposure to noise can result in hearing loss in many industrial workers. In many cases, hearing protective devices (HPDs) are considered as the main protective objects. As a large number of workers in the Iranian carpet weaving industry are usually exposed to noise levels exceeding the permissible exposure limits. Objectives: This study was conducted to evaluate the use of HPDs, quality of available equipment and possible reasons for lack of protective devices usage. Methods: In a descriptive, cross-sectional study, 136 workers of Kashan carpet industries exposed to noise pressure levels greater than the action level defined in the Iranian legislation (85 dB (A) 8 h/d) were evaluated for HPDs use. The quality and HPDs suitability was defined according to the workers exposure to noise, available HPDs and their Noise Reduction Rate (NRR). The reasons for non-usage of HPDs were evaluated as well. Data were analyzed using the SPSS v. 18 software. Results: The mean age and work experience of workers were 31.39 ± 5.6 and 4.35 ± 2.5 years, respectively. Among the exposed-to-noise personnel, 7.35% used HPDs constantly; 75% used HPDs for only short periods of time (less than four hours) and 17.65% did not make use of them at all. Regarding the sound intensity and the level of noise reduction of HPDs, among the 112 workers who used such devices, 59.6% had HPDs with appropriate protection and 22.8% used inappropriate ones. There was a significant relationship between age, work experience, education and use of HPDs. Inappropriateness and difficulty in the use of the devices were also reported as the main reasons for not using them. Conclusions: This study showed an unsatisfactory situation in the mentioned industries for HPDs usage; low percentage of usage, low preparation rate, the inappropriateness of some of the HPDs, and unawareness of some of the workers. A noise training and education program is recommended to be developed for workers in order to protect them from hazardous noises. Every day, in many workplaces, workers are exposed to various harmful agents such as noise, vibration, stress, etc., which may have negative effects on their health safety and performance (1-4). Noise is considered as the most common and one of the most harmful agents of working environments worldwide (5, 6). Almost 600 million workers around the world are routinely exposed to noise levels exceeding 85 dB (7-9). When the noise intensity level goes beyond permissive noise level, it might leave adverse effects on different functions of the body such as hearing, blood circulation, cardiovascular, nervous system and work efficiency (10-13). It has been reported that more than 200 million people worldwide are subject to the effects of noise (14). One of the most important and most certain effects of exposure to high levels of noise is noise-induced hearing loss (15-17). Hearing loss due to industrial noise is a sensory-neural hearing loss that normally increases and progresses during the years of noise exposure and is an irreversible damage. However, it is preventable through avoiding excessive exposure to noise and proper use of personal protective equipment such as HPDs (18-21). Studies have found that the prevention of hearing damage through the use of Hearing Protective Devices (HPDs) in the industry is low, varying from 20% usage in some studies (3) to 30% - 50% in others (22-24). Although hearing protection devices are seem to be a temporary solution, due to some economics and applicability aspects, they are widely used as the only measure against noise exposure (25). However, it is also well known that non usage of hearing protectors 100% of the time when the noise is at a high level will significantly reduce hearing protection devices effectiveness. Therefore, it is essential for personal hearing protective devices to be available in high-noise workplaces, yet it is also important for workers to be aware of the need to use them. Moreover, and despite the report of an increase in hearing protection devices sales, the occurrence of hearing loss due to noise has also increased, which could be due to the non-effective use or inappropriate HPD (25). Hearing protectors are not worn by many workers due to various reasons, such as feeling of discomfort, interference with communication, etc. (26, 27). Workers are generally not motivated to do anything about noise at work because noise effects and hearing loss occur gradually, are not visible and have an uncertain time course in individuals (28, 29). People who develop a noise injury are typically unaware that their hearing is affected until the loss is quite significant (30). Brady (31) reported that people’s awareness about noise exposure and its effects could play an important role in their safety actions, especially in the use of Hearing Protection Devices. In a report published by NIOSH, it was confirmed that textile industry (especially weaving) is among the most important industries. More than 87% of workers from this industry are exposed to noise levels over 80 dB (32, 33). As the typical noise control strategies such as engineering and physical controls (particularly controls within the source and its transitions ways) are sometimes not practical or they are very difficult and demanding, use of appropriate and standard HPDs including ear plugs and ear muffs seem to be the best alternative. If properly applied,this simple and inexpensive strategy can prevent damage to the hearing of exposed workers (34-37). However, it seems that the comfort and acceptability of HPDs for workers still remains a critical issue. Kashan, as shown in Figure 1, is one of the cities of Isfahan province (Iran) and is internationally famous for manufacturing carpets, silk and other textiles. Considering that 80% of industries in Kashan are either carpet manufacturing or related industries and the noise is an integral part of carpet manufacturing looms and machines and also a large proportion of the working population in Kashan work in carpet manufacturing workshops as the main axis of the industry and work force, in order to preserve and protect the human resources as well as to enhance work efficiency and productivity and production, it is necessary to prepare and provide the workers with appropriate and standard HPDs. Hearing protective devices should also be available and acceptable to the workers and there must be strategies and programs for measuring and evaluation of noise levels in this industry and use of HPDs. However as already mentioned, HPDs usage is severely affected by many factors and today their usage in environments with noise pollution is not satisfactory. This study was conducted to evaluate the use of HPDs, quality of available equipment and possible reasons for lack of HPDs usage in Kashan carpet industries. In a descriptive, cross-sectional study during year 2014, 136 workers of carpet weaving industry were evaluated for Hearing Protective Devices (HPDs) use. Where, n is the sample size, Z: 95% confidence interval, which corresponds to α = 0.05, β error = 0.99 and ω = correlation factor, which was 0.35 based on other studies (38). 1. In this study, 110 worker’s exposure to noise was measured with Cel - 420 dosimeter. Equivalent sound level for each of the samples was determined (dosimeter was calibrated, and measurements were done on A-scale and slow response). 2. Based on the amount of exposure to the noise at each work shift, the necessity of using HPDs by the workers was evaluated. Non-permissible noise was defined as exposure to noise levels greater than or equal to 85 dB during an eight-hour shift work. The level of appropriateness of HPDs was determined and examined based on the Noise Reduction Rating (NRR) provided by the HPDs. 3. A checklist including the subjects’ demographic information, noise intensity level in the work environment, HPDs type, use or lack of use of HPDs, the durations of use of HPDs within the work shift and finally possible reasons for not using HPDs was designed and filled by occupational health experts. The usage of the HPDs, including their placement in the ear canal (ear plug) and covering pinna (ear muff), was investigated by observation. The appropriateness of the HPDs was defined according to its ability to bring down the noise intensity below 85 dB, while working in a noisy environment. How does Noise Reduction Rating (NRR) change decibels of exposure? Noise Reduction Rating is a unit of measurement used to determine the effectiveness of hearing protection devices to decrease sound exposure within a given working environment. Classified by their potential to reduce noise in decibels (dB), a term used to categorize the power or density of sound, hearing protectors must be tested and approved by the American National Standards (ANSI) in accordance with the Occupational Safety and Health Administration (OSHA). The higher the NRR number associated with a hearing protector, the greater the potential for noise reduction. Finally, the obtained data was analyzed by statistical tests and SPSS v.18. It should be noted that obtaining response to all the questions was conducted with consent and awareness of workers. The results were used only for research purposes and all steps were conducted without mentioning the name of factories, workshops and workers by a coding technique. At the time of the study there were 600 factories in Kashan and 310 of them were carpet factories. On the other hand, 3893 people were working in the carpet industry and 2184 of them were exposed to noise in their working environment, but unfortunately 1456 (67.66%) of exposed workers did not have access to HPDs and Only 728 of workers (33.33%) actively used HPDs. Figure 2 indicates that 13.8% of workers were working in areas with noise level of 86 to 90 dBA, 48.4% working in areas with noise level of 91 to 95 dBA, and 37.4% working in areas of more than 96 dBA. The results of this study indicated that six different types of HPDs were provided to workers in the mentioned factories; including six types of earplugs (NNR = 25, 25, 26, 29, 21, 23) and also two types of earmuffs (NNR = 21 and 30). Due to the ethical consideration, it has been avoided to mention the manufacturers name and alphabets were used to show the HPDs according to Table 1. The percentage of mentioned HPDs users among 728 workers are shown in Figure 3. Regarding the objectives of the study, subjects were selected from workers who had access to protective HPDs. Therefore, in the present study, 136 workers of Kashan carpet industries were investigated and the percentage of mentioned HPDs users among 136 workers are shown in Figure 3. All of the 136 selected subjects were male; the minimum and maximum ages were 19 and 59, respectively (31.39 ± 5.6), and their mean work experience was 4.35 ± 2.5. Overall, 19.6% of the subjects were primary and secondary school graduates, 50.4% had finished high school education and 30% had an academic degree. As Table 2 presents, among the workers who were exposed to noise, 7.35% constantly (eight hours) used HPDs, 75% used HPDs for short periods of time (less than four hours) and 17.65% never used HPDs. Among those who used HPDs, 66.9% used internal HPDs (earplug) and 13.2% used external ones (earmuff). As can be seen in Tables 3 and 4, from 112 workers who used HPDs, with respect to the noise intensity level in the workplace and equivalent noise level calculated based on material and methods, HPDs NRRs, 81 workers (59.6 %) had access to appropriate HPDs and 31 (22.8 %) used inappropriate HPDs. However, as the subjects’ age increased, the percentage of subjects who used HPDs was enhanced and the frequency of “I never use HPDs” respond decreased remarkably. Chi-square qualitative analysis indicated a significant relationship between age, work experience and use of HPDs. However, a high percentage of > 30 year-old subjects responded that they used HPDs occasionally. Further investigations showed that compared to under 30 year-old group, > 30 year-old group used HPDs constantly and frequently (P < 0.0001). On the other hand, with increasing work experience, HPDs use also increased (P < 0.0001). Further analysis showed that there was a significant correlation between the level of education and the use of protective hearing devices. More educated workers who were high school graduates or had academic degrees used HPDs more than workers who had primary and secondary school education (P < 0. 0001). Table 5 shows the frequency of reasons for not using PPDs. Due to the machinery used, noise in carpet factories is obviously a prominent problem. Even though there are several methods to reduce or control the noise transmitted to the workers and the most effective of these is the engineering controls, that is, remove the noise at the source, however, applying this technique is relatively expensive and may not always be feasible or practical or may be insufficient to reduce noise to an acceptable level (41). Hearing protection devices are known to be very effective, but they may have some problems (42, 43) and some of the workers may not properly use these protective measures. This study investigated the use of personal hearing protective devices in carpet industries in 2014. These industries were located in Kashan, Iran. 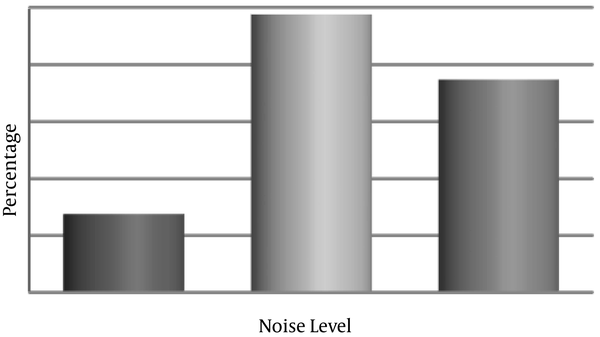 The findings of this study showed that a large percentage of selected workers are working in areas higher than the action level for daily occupational noise exposure defined in the Iranian legislation (85dB (A)) for eight-hour/day and confirmed the fact that applying administrative and engineering noise controls in Kashan carpet industries has not been capable to make a safe and healthy work environments, therefore the importance of HPDs usage was highlighted. It can be understood from the evaluation of HPDs usage that although it is necessary to use the HPDs constantly, the frequency of HPDs usage in Kashan carpet companies was not satisfactory. Among the study participants, 33.33% wore hearing protective devices, while 66.66% did not have any kind of HPDs, which is an unacceptable condition, and efforts should be made to improve the situation and more attention is expected from governmental experts and managers. In addition, among workers who used HPDs, 7.35% used it constantly and 75% used it for less than four hours per work shift and 17.65% of workers never used their HPDs. The results showed that 0.45% of all Kashan carpet weaving workers, who were exposed to noise, used HPDs constantly, which regarding the noise intensity level of carpet weaving machines, this number is very small and insignificant. The result of a number of studies are consistent with our study, such as the study conducted among gold miners in South Africa in 2010; occasional use of the HPDs was more than constant use, but there was a difference between their results and that of our study (7.35%) and this can be due to the training of all gold miners (44). The trend shown by the results of the study conducted by Jahangiri (45) on petrochemical workers is consistent with this study but the number of workers of our study, who never used HPDs was about 1.5 times more than petrochemical workers. The results of studies conducted in Malaysia (46) and Saudi Arabia (47) are partially consistent with this study. However, certain factors like pre-employment training of the workers, employers’ educational level and type and quality of HPDs were the most effective factors in encouraging workers to use HPDs and they were stated in some other studies like studies investigating the use of HPDs in Iranian cities of Qom (48) and Hamedan (49). The Health and Safety Executive (HSE) study from the UK reported that one of the effective factors that increased the frequency of HPDs usage by the workers is removing the underlying causes that make HPDs unacceptable to the workers (like discomfort and difficulty in normal communication) (50, 51); this research also referred to some of these reasons. Therefore it is necessary to note that hearing protective devices not only reduce noise to below permissible levels but should also be convenient and compatible with other workers’ protective devices in order to be accepted by them. On the other hand, it is necessary to take into account workers suggestions about selection and use of HPDs. Subjects from Kashan carpet industries, who did not use HPDs, described the following factors as the most important reasons for not using HPDs; discomfort and difficulty of use, having problem in normal communications with their colleagues and coworkers, ears sweating and itching, wrong attitude about the necessity to use HPDs, lack of awareness about impacts of being exposed to high noise, and the uncertainty about when to use HPDs. The findings of the present study were consistent with the results of previous studies, such as a study carried out in Sistan Baluchestan Province of Iran. It was shown that 28.3% of industrial workers did not use HPDs and their main reasons for not using HPDs were inconvenience during use, disability in hearing conversations, sweating and itching of ears and inadequate training (52, 53). According to the obtained results, evaluation of different factors, and workers opinion about appropriateness and usability of HPDs, it should be said that the A-B-D-E-F type of HPDs could be suitable for use by workers in Kashan carpet industries. Among the workers who used HPDs constantly and occasionally, 59.7% were satisfied and 28.94% had little satisfaction. On the other hand, the obtained results and evaluation of different factors showed that workers personal factors such as, education, age and work experience were consistent with the use of HPDs, so these factors must be taken into account while using HPDs. These findings were compatible with the results of other studies (54-56). This study showed an unsatisfactory situation in the carpet industry for HPDs usage: low percentage of usage, low preparation rate, inappropriateness of some of the HPDs, and unawareness of some of the workers. Workers encouragement and monitoring the workplace for use of HPDs is also of prime importance. Therefore experts’ surveillance and applying legal requirements in these industries is inevitable. Finally, considering the high frequency of workers’ exposure to occupational noise and the importance of HPDs for protection, paying attention to this problem would be critical. A noise training and education program is recommended to be developed for industrial employees in order to protect them from hazardous noises. Authors’ Contribution: Samaneh Eidi designed the study, supervised all the experimental design, analyzed and interpreted the results and drafted the manuscript. ; Abdolmajid Fata contributed to the study design and supervised all the experimental design; Seyed Amir Kamali, Zahra Hajari, Reza Farid Hosseini, Mehdi Bakhshaee and Ali Naseri contributed to the sample collection.